Since he has a summer birthday, my son's "school birthday" celebration is tomorrow. I decided to use it as an opportunity to practice my cake pop skills. 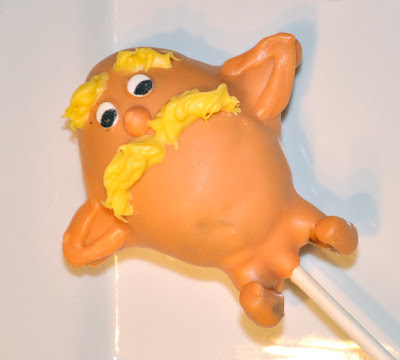 I followed Bakerella's tutorial to make Lorax cake pops for his class. I know, I know, they aren't Bakerella quality, but not bad for a first attempt, right? I'm hoping to perfect them on the second try in July! !